The NH Law Enforcement Officers’ Memorial Association pledges to all survivors and fallen heroes that we will never forget your commitment and sacrifice. We sincerely hope that our efforts demonstrate in some small way our deep respect and appreciation to our fallen heroes, their families and the entire NH Law Enforcement Community. The NH Law Enforcement Officers’ Memorial Association is made up of a small group of volunteers who are dedicated to the preservation of the Memorial monument and wall in Concord, NH. This same committee also works tirelessly throughout the year to fundraise, organize and perform a ceremony each May to honor our fallen NH Law Enforcement Officers as a way to remember their sacrifice. May 15 has been designated each year as the National Law Enforcement Officers’ Memorial Day to honor and remember those Officers who have died in the Line of Duty. A Memorial stands in Washington, D.C. and a ceremony is held each year for those officers who have died throughout the previous year. After returning from the National Ceremony in Washington D.C. a NH survivor wondered what New Hampshire did to remember those NH Law Enforcement Officers who had died in the line of duty. 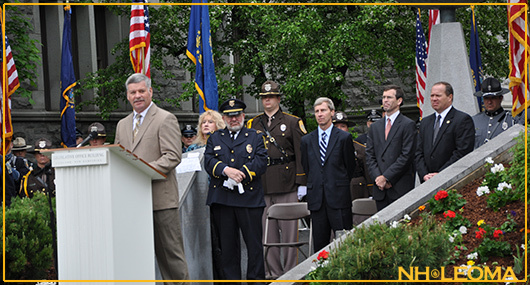 As a result, in January 1993 the New Hampshire Law Enforcement Officers’ Memorial Association was formed to identify those NH law enforcement officers who had died in the line of duty and pledged to remember those officers each year with our own NH Ceremony. The Memorial Association pledges to all survivors and heroes that we will never forget your commitment and sacrifices. We sincerely hope that our efforts serving on this committee demonstrates in some small way our deep respect and appreciation to the New Hampshire Law Enforcement Community and their families.